Role Models to see the possibilities! Confidence to make it happen! 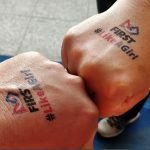 Visit these pages to download the free artwork to make your #FIRSTLikeAGirl own boards, buttons and temporary tattoos for your events! The videos are only about a minute long and usually only take a few minutes of footage to create. When female members, mentors or community members share their stories they encourage and instill confidence in young women! 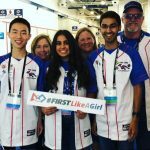 A social media movement to encourage girls and women in STEM and FIRST. By showcasing the many incredible women of FIRST and their stories, girls can find role models who they identify with and are inspired by. Through this social media campaign, we empower girls with the confidence to overcome cultural pressures, follow their dreams in STEM, and become active members of the FIRST community. 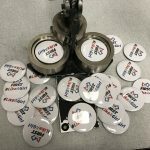 Create a video, sponsor our buttons, encourage young women and girls to pursue STEM, join or mentor a FIRST team or volunteer for one of the more than 2,600 FIRST events in your community. Be a part of the solution, be a part of the FIRST community! This is how we do #FIRSTLikeAGirl! We encourage other FIRST teams to create videos of their students and mentors and regional volunteers to encourage young women to join teams and for women in your communities to mentor and volunteer. Good luck!